You know when you blink and then when you open your eyes again an entire season has passed? That’s how I feel… summer was full of fun and sun (and smoky skies) and bugs and conferences and camp visits and more bugs and then some more fun. And now we head into the new school year! I have more classroom ideas buzzing around in my head than I can possibly put together but you’d better believe I’ll try. First, a Hallowe’en display needs to be made. 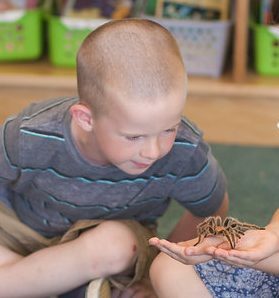 Apparently some people think tarantulas are scary…weird. Anyway be on the lookout for Lady Buggy at a special event near you! Boo!